If you wanna talk about what it is like to run the gamut of emotions in one race, just ask Louis Mechalides. After Ted Christopher fell out of the Super Late Model points championship on Thursday night, the race for the title was down to Louis Mechalides and Mike Fritts. 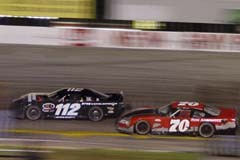 Heading into the 100-lapper finale on Saturday night, the gap between the two was a mere 20 points. At the end of the night, the gap was a mere four points. Fritts, who had really turned on the juice in his #112 Super Late Model late in the week after a plethora of bad luck early on, jumped to the lead right at the start of the race and set his own pace. Mechalides fell in line and just rode around in the sixth and seventh positions for most of the first half of the event. bright #47 was off the pace and headed to pit road and behind pit wall. “At the beginning of the race the car was real good and I was trying to stay in line and pass a couple of cars,” said Mechalides. “I drove down in the corner and the sway bar broke right off of it. I thought I was getting a flat tire. I had no idea what was broken. We had been dragging all week but we were fast and we hadn't changed anything. But not so fast. Enter a simple piece of chain. 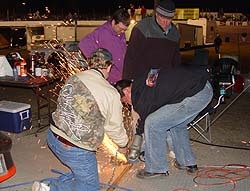 “We came in the pits and Donny and Jason and the rest of the guys got it chained up. Jason Boyd went in and stole a chain out of a trailer next door that that team used to hold their pit carts down. The crew couldn't tell me what was wrong with the car at first because they were trying to work on the car. So I jumped out to see what was wrong with it. “The guys fixed it by using the chain. The car was faster than before, but that might have just been me being mad. Fritts was still in the lead and because of that, and Mechalides’ misfortune, it looked as if the championship race was over. But not so fast. Enter hotshot young gun Jeff Choquette. Following the halfway point, it looked like Choquette got shot out of a cannon. The youngster, who has been the dominating force at New Smyrna Speedway before Speedweeks (he won four races in a row at the half-mile dating back to last year), jumped from fourth to third to second and finally started placing pressure on Fritts for the race’s lead. Choquette finally got a big run and jumped to the inside Fritts coming out of two. The two cars bounced off of each other with smoke flying and both sideways. Choquette was able to make the pass and Fritts did a tremendous job to keep the car out of the inside wall, but ultimately lost several positions before falling back into the swing of things. 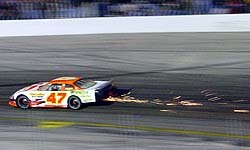 Eventually, before the race’s end, Fritts would lose a few more positions in his ill-handling car and finish sixth. 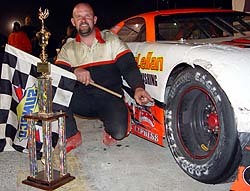 Jeff Choquette won his sixth-career race at New Smyrna Speedway on Saturday night. Choquette wouldn’t be challenged again and would go on to win his second-straight Speedweeks event (Choquette was deemed Friday night’s winner after Jack Landis was disqualified in post-race tech… more on that in Leftovers later in the week on Speed51.com). Mechalides would get his car fixed and back out on the track and would cross the line in 20th position. So as Victory Lane celebrations were going on for Choquette, officials were busy calculating and recalculating the points. 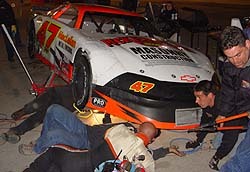 Finally, after much anticipation, it was announced that Mechalides, despite his problems, had held on to capture the Speedweeks Super Late Model points championship. “I didn't know how it was going to end up,” admitted Mechalides. “We've had such a good week compared to most years. 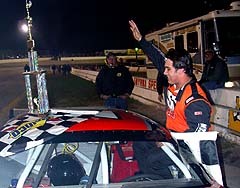 We won a couple of races and set fast time with a new racecar. And despite losing the points title and not being able to defend last year’s Super Late Model crown, Fritts took losing in good light, not placing blame on anyone and taking the good with the bad. “We were just trying to hold them off, but it was just a matter I time,” said Fritts. “Something happened in the car. The panhard bar bracket bent, which was a homemade deal that we tried. The trailing arm ended up under the suspension and it was just like having a wood block for a right rear spring. That pretty much meant we were a sitting duck there. We tried to hold them off as long as we could, but we about took ourselves out in the process. But even being rooted out of the way, Fritts was still thinking the championship would be in hand. “We thought we had the points deal all wrapped up but I guess we didn’t know how to figure up points. We were just kind of riding, thinking we had the points won, but I don’t think we could have finished any better anyway. It was no surprise to see Choquette back in Victory Lane at New Smyrna. Counting his default win on Friday night, Choquette has now won six of the eight races he’s ever run at New Smyrna Speedway. Louis Mechalides knew the key to his title was the right front tire. And so after Choquette’s Victory Lane celebration, it was Mechalides’ turn to celebrate his championship with those that helped make it possible. “The crew got it done and everybody is excited to run good. The championship is a bonus. And the star of the night in Mechalides’ eyes… that simple piece of chain, which helped propel him to the title. Everyone swarmed around Mechalides' car, including Louis himself (top, in suit) and a simple piece of chain saved them (bottom). Jeff Choquetter (#70) puts the heat on Mike Fritts (#112) in a fierce battle.